Tim Knoll – is perhaps the best thing that happened with the city of Milwaukee, Wisconsin, USA, for the last 33 years. 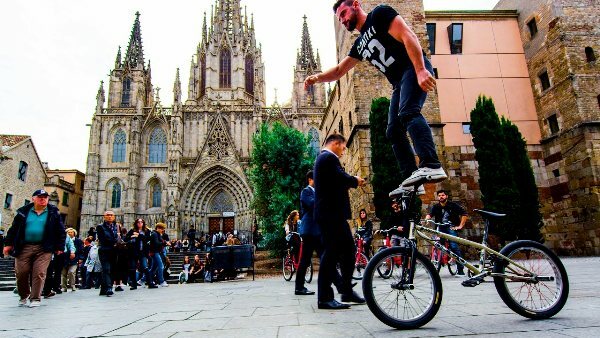 An internationally recognized BMX stunt, trick rider, he became famous all over the world because of his unique technique of riding – BMX Freestyle, which combines various tricks on BMX, acrobatics and objects of the urban environment as “props”. His video on YouTube have vast reach – millions views worldwide. When it seems impossible to be more cool, he shows you his new record, which claims the opposite. “It’s so fun to do!” – says the athlete, who is an idol for thousands of extremals and riders on the planet. Tim Knoll for BMX-community – like Travis Pastrana for motofreestyle. Knoll is a bright example of how a person, popular in the professional community, gained fame far beyond its limits. In this, Milwaukee’s star “blames” social networks: “I’m really lucky with how popular social media is.” After the «Original Bike Tricks» video went viral, several of his video clips have been featured on television shows throughout the world, including the famous American program “The Tonight Show”, which audience is far from “adrenalinists”. The famous brands became interested in the rider: Ford, Contiki Tours, Doritos Jacked 3D and Red Bull. Knoll has been featured in online video ad campaigns for them, then set a Guinness World Record, after gave a TEDx talk about using creativity to gain notoriety. One of the latest popular videos about how Knoll shows all his best was filmed in Berlin as part of the project «BMX meets Parkour» in conjunction with Red Bull, known for its extreme love to extreme. If you want to watch more videos with Tim, and this will be 100% so, have a look at his YouTube channel, where Knoll puts out the freshest tricks. Also a star from Milwaukee can be found on Facebook. Knoll became obsessed with flatland when he was 15. So more than half of life he is in. Can he still get better? Knoll answers this way: “I think I’ve been almost at the same skill level for the last seven years or so, but I’m doing more things, different things that haven’t been done before”. Today Knoll is not part of a team, and he’s not working with agents or competing for anything. He is directing and producing his own videos. He’s an independent contractor, who identifies himself as an artist. “I focus more on just being an innovative biker, so I guess when I’m creating new tricks and new patterns of movement with a bike it almost turns into performance art in a way”. 1. He never got injured while performing his tricks more seriously than the usual shoulder dislocation. 2. The music for the majority of his videos is made by brother Phil, which Knoll never forgets to mention in his interviews. 3. Knoll does not have any photos in Instagram. 4. Tim was a diver in school. 5. Despite world fame, Knoll perfectly suits to his native city of Milwaukee and successfully works at the company NSI Electrical Contractors. 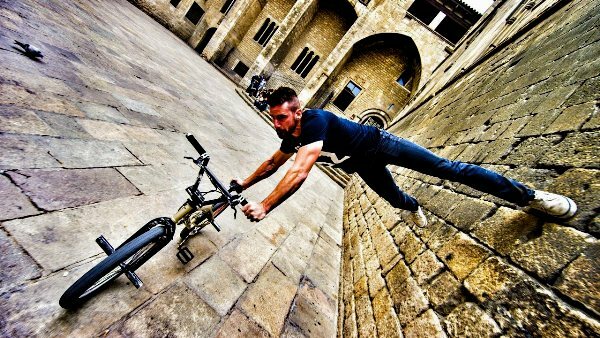 Posted in News, Sport and tagged bmx, extreme sport, sport. Bookmark the permalink.